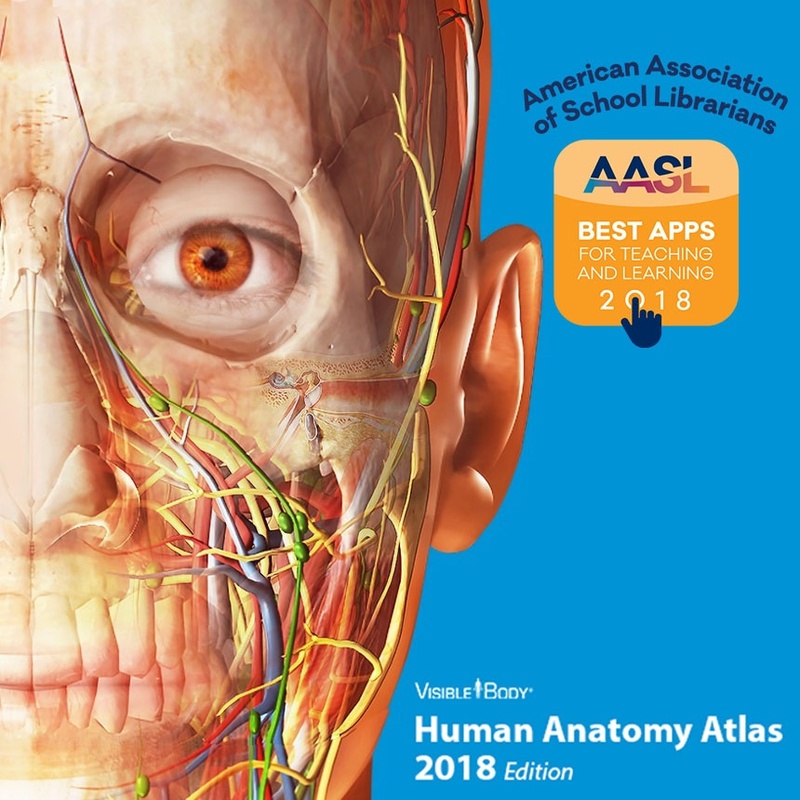 June 23, 2018 — The American Association of School Librarians awarded Visible Body's Human Anatomy Atlas the distinction of being one of its 2018's Best App for Teaching and Learning. Teachers and students use Human Anatomy Atlas to turn any room into a 3D immersive learning experience and see inside the human body. The AASL noted that "The Best Apps for Teaching & Learning recognition honors exceptional value to inquiry-based teaching and learning as embodied in the AASL Standards. Recognized apps foster the qualities of innovation, creativity, active participation, and collaboration." "Recently we've worked with companies like Apple, zSpace, and Google to understand how their latest virtual and augmented reality offerings can increase student engagement when learning anatomy and physiology using our 3D anatomy models and animations," remarked Andrew Bowditch, the CEO at Visible Body. "Human Anatomy Atlas for iPhone and iPad, Android devices, and zSpace offers augmented reality experiences that make it easy and fast to create virtual learning experiences—that is particularly compelling in the K12 space." To support career technology education, health science curricula, and biology courses that teach anatomy, the Visible Body Education Team worked with instructors to create free anatomy lab worksheets that students and teachers can download from the company's website. The worksheets and accompanying teacher lesson plans make it easy for teachers to move a lab that uses real specimens like a cow's brain or a sheep's eyeball to using virtual 3D dissectable models in augmented reality. Visible Body offers free trials for instructors and librarians at U.S. schools. The trials enable schools to test for themselves if theses virtual anatomy teaching apps fit their students' learning needs.